Why use THE ORIGINAL Tyre-Grip™ ? Well, look no further we have the right solution for you called Tyre-Grip™/Shoe Grip. Two powerful products that are enough to keep you on the road while remaining safe on the surfaces, in which you drive or walk. We understand that snow plows, and salt trucks do a pretty good job of keeping areas clear, but the truth is that until the snow and rain are completely melted, you still have to be very careful during these type of weather conditions. 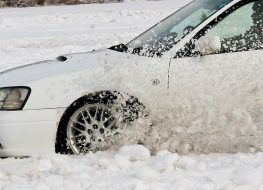 There are steps you can take to increase your car’s traction when such hazards are present, but unfortunately some measures to increase tire traction are meeting with resistance, and even banned on certain road surfaces. Have You Ever Been Into This Situation Or Feared To Have Been In? 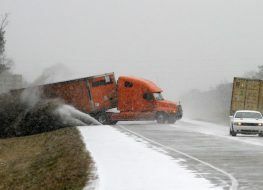 Many states prohibit the use of snow chains and other traction devices because they damage road infrastructures. But now there’s a proven alternative…Tyre-Grip™, for intense driving conditions, or even situations where your tires just don’t grip! Posing no danger at all to highways and local road infrastructures, Tyre-Grip™ is a thin resin film applied directly to your tire treads for instant results! Unlike chains and similar devices, it won’t harm your vehicle’s drive train, either. 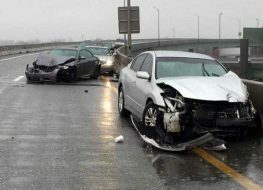 This is especially important for hybrid cars because most hybrid manufacturers explicitly void warranties on their cars when chains and other traction devices are used. But the best thing of all about Tyre-Grip™ is – it works! No more slipping, sliding or shuffling your feet to stay upright on slippery surfaces! Revolutionary Shoe Grip is designed for pedestrians to walk with ease and self-assurance on snowy, wet or icy driveways, sidewalks, stairs and streets. Put your best foot forward with Shoe Grip! Same dynamic anti-slip properties as Tyre-Grip™! 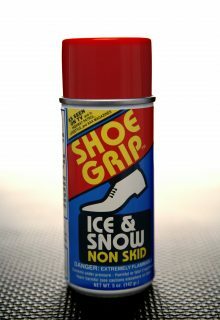 Dramatically reduces dangers of slipping on ice and snow! Specially designed nozzle sprays targeted area without waste! Harmless to leather or rubber! Spray Shoe Grip on soles of shoes, let dry, and GO! Available in recyclable 5 oz. aluminum can for easy storage! 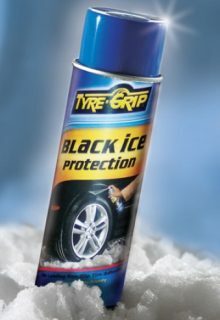 Improves tire traction up to 300% on slippery wet surfaces, black ice, sleet, and snowy roads! Retains effectiveness for at least fifty (50) miles! Lasts 20+ applications/all four tires! Environmentally safe, causes no physical or mechanical degradation to body paint, metal or tires! Natural resin adhesive is compatible with all vehicles! Causes no damage to roads or driveways! 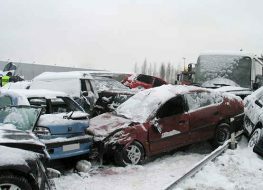 Reduces risk of auto accidents due to hazardous road conditions!